A lawyer at the top of his career. When a case turns toward the dumps he's offered a shining proposal. But is he willing to fall to temptation and abandon his hard fought principles that have gotten him this far? Will he take this offer and throw the man he's defending to the dogs? Or will he stick to his principles and resist the cruel fate they're trying to leave his client with? 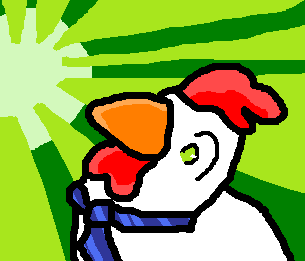 I like the contrast of a white chicken on a colored background. He looks very surprised, as if he's still taking it in, so it's hard to tell what the outcome will be. I certainly hope he sticks to his principles.